Recently, Facebook has been in the news for exposing data that affected up to 87 million of its users. Currently, the fight to absolve the social media giant of any wrongdoing is intensely waging on the Senate floor and all over the news. However, before Facebook was fraught with big data scandal, they made a not-so-subtle change to their newsfeed algorithm. Back in January, Mark Zuckerberg announced from his Facebook page that the social media site will begin to change the way users see content on their newsfeeds. Content developed and published by brand advertisers, news sites, and other major corporate entities will be pushed down and user-generated, more organic content will be weighed more. This is an effort to take the site back to its roots of being a place where you can reconnect with loved ones and friends. 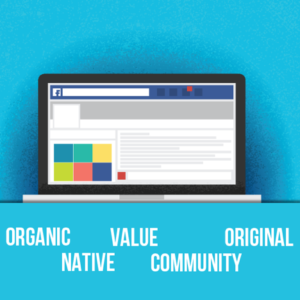 Over the years, Facebook has become a major entity in the online marketing industry. While many people thought it wouldn’t last, it has become a primary form of marketing for many brands, whether startup or Fortune 500. Not just with sponsored content, but also with regular updates and user engagement. Facebook has grown to be a major player in how brands advertise themselves to their Internet savvy consumers. With the new algorithm, the rules of the game have changed. It’s important to note that the Facebook algorithm change does not mean content from your Business Manager (boosted posts, ads, etc.) are just never going to show up. They will be delivered as usual to their target audience. What is changing is the organic nature of the actual newsfeed. Instead of customers seeing your latest gimmicky commercial, your latest spin on incorporating your logo branding into memes, expert usage of brand gifs, or gossip news about the Kardashians, they’ll be met with more content about their niece’s first soccer season and updates about a former college roommate’s pregnancy journey. Content that is meant to spark communication and reconnect is Facebook’s current strategy for the site. You can also work to circumnavigate the loss in organic traffic by utilizing marketing efforts from other platforms. Use your blogs, website, and other social media sites to encourage visits to your Facebook page. What we’re seeing from Facebook is a complete 180 from the path Facebook has been venturing down. Over the years, Facebook has been notorious for offering low-value content that simply encourages useless notifications instead of useful news. The goal of the algorithm change doesn’t bode well for businesses. As casual users; however, Facebook wants to encourage meaningful interaction. The goal is put the emphasis back on creating communities and less on being a curated commercial entity. This isn’t the end of advertising and publishing on Facebook. It just means as businesses and marketers, we need to put our thinking caps on and work a little harder. Neff Associates Announced as a Leading 2019 Agency in Philadelphia!